Are you ready for some summer family fun? If so, check out this awesome Kalahari Waterpark Resort Sweepstakes! 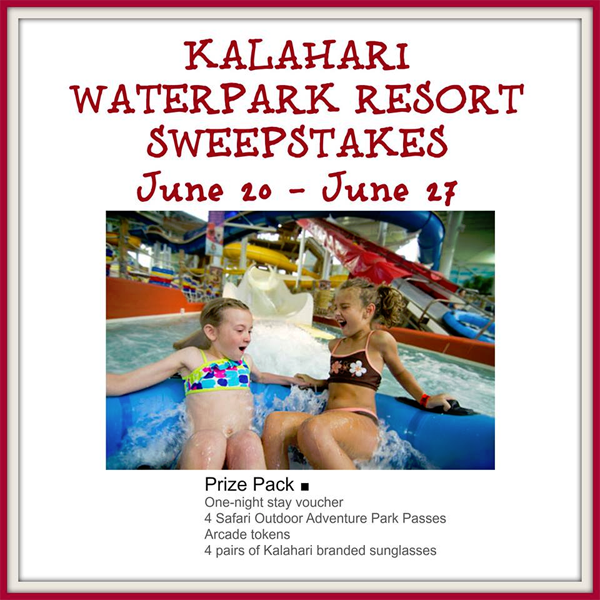 Enter to win a prize pack to enjoy one night at a Kalahari Waterpark Resort in the US! Sweepstakes is sponsored by Kalahari Resort and hosted by Mom Blog Society. Kalahari Resorts and Conventions in is home to America’s largest indoor waterpark sitting at 173,000 square feet, in addition to a 20,000 square foot Big Game Arcade Room, 77,000 square foot outdoor waterpark, Safari Outdoor Adventure Park and many more activities for the entire family to partake in. Upgrades to the resort include a revamped kids’ area, Coral Cove, with enhanced activities and remodeled retail shops, Spa Kalahari, Spa Kalahari Jr. and top-notch dining options. Kalahari Resort and Conventions was also recently named the 13th best family-friendly hotel in TripAdvisor’s 2014 Travelers’ Choice Awards. Currently in its 12th year, TripAdvisors’ Travelers’ Choice Awards are determined based on the reviews and opinions of millions of TripAdvisor travelers around the globe. The awards honor the world’s most outstanding properties in the categories of Top Hotels, Bargain, B&B’s and Inns, Family, Luxury, Romance and Small Hotels. Kalahari Resorts in Wisconsin Dells, Wis., and Sandusky, Ohio, deliver a “world-away” waterpark resort and conference experience beyond expectations. The authentically African-themed Kalahari Resorts, privately owned by the Nelson family, are home to America’s largest indoor waterparks. All Kalahari Resorts feature well-appointed guestrooms, full-service Spa Kalahari, a fully equipped fitness center, on-site restaurants, unique retail shops, and a state-of-the-art conference center. Kalahari Resorts and Convention Centers frequently receive awards and accolades for our guest and convention services. Recent recognition includes: Condé Nast Traveler’s #1 World’s Coolest Indoor Water Parks, TripAdvisors’ 2014 Travelers’ Choice Awards, Silver Star recognition for Best Family-Friendly Meeting Hotel and Resort in Smart Meeting’s 2014 Smart Stars Awards, Clean the World’s Top 50 Hot Properties in 2013, January 2014 Diner’s Choice recognition from OpenTable, the Daily Herald’s 2014 Reader’s Choice Awards for Best Indoor Waterpark, selection as one of the nation’s Top Family Resorts by Family Fun magazine for 2013, being named the Best Conference Center in the state by the Wisconsin Hotel and Lodging Association, and selection as the Corporate Meeting Destination of the Year by Cleveland Business Connects magazine. For reservation and guest information, call 1-877-KALAHARI (525-2427) or visit: KalahariResorts.com. Winner may pick their location. Open to the US only. Void Where Prohibited must be 18 years of age or older to enter! Ends June 27th. 11:50 pm est. We would love to check Kalahari out! It looks like the kids would have a blast! My family would love to go to the one in Sandusky, Ohio.